It’s amazing what 30 minutes in my garden at the end of a hectic day can do for my mood. Being surrounded by green growing plants filled with blooms and fruit fills me with a calm serene energy. Even when it’s hot outside, as it is these days, it feels cooler in the garden. These few minutes spent together as my husband waters and I harvest create a connection we just wouldn’t get sitting in front of the TV. There is a rhythm to each of our routines and together our individual rhythms become a kind of dance. We don’t speak much, except to comment occasionally about how big the cantaloupes are getting or how much better the tomato plants look now that we’ve shaded them. The worries of the day may be discussed later, but not now, not here in the garden. Within the rhythm of our gardening, we connect to the rhythm of the plants and the seasons. We connect to the food we will put on our plates. We engage more deeply in the broader rhythms and cycles of life. There are many benefits to gardening, but what strikes me this evening is the huge bounty a small, daily harvest represents. I have just enough lettuce, herbs, carrots, radishes and cherry tomatoes for tonight’s salad for two. The larger tomatoes I’ll save to make salsa later this week. I’ll roast half the bell peppers and eggplants, along with some of the fresh garlic we harvested last week, to accompany our pork tenderloin. The strawberries will be nice with breakfast tomorrow. The remaining squash, eggplant and peppers will store in the fridge for a week or longer. They will not go to waste, as it will be several days before more of these will be ready to pick again. And when certain plants are producing more than we can use within a few days, I can freeze some away for the future or lavish my excess bounty on family, neighbors and friends. And so, tonight and every night for months now, I have enjoyed the just enoughness of my small, daily harvest. 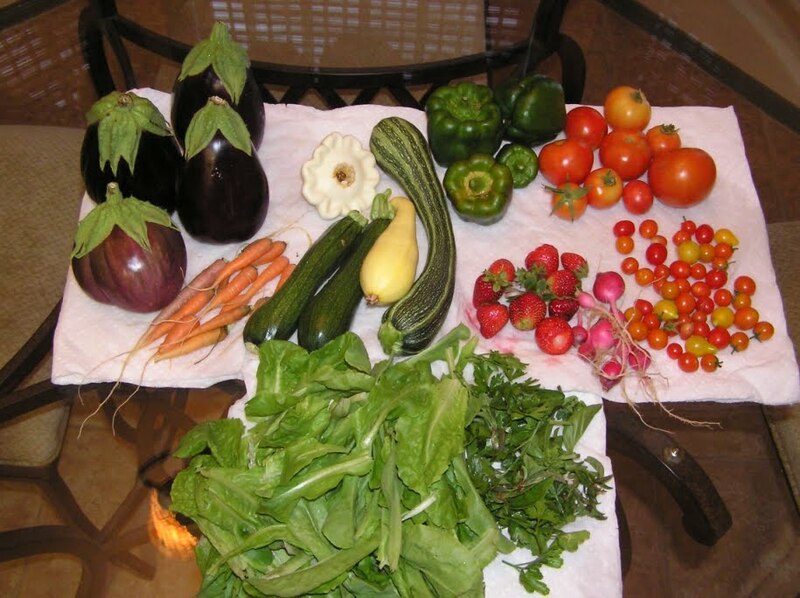 The pleasure of eating what my husband and I have grown with our own hands. The sure knowledge that there will continue to be just enough – that as soon as I’ve used up the eggplants and squash picked today, more will be ready to harvest. That a wonderful apple harvest will follow a month or so after the peaches and the oranges will arrive at Christmastime. And all of it will be just enough to fill our needs and allow us to be generous with any surplus. What if, at the end of each day, I took stock of my whole life this way? Would I learn to appreciate the perfect just enoughness of everything? Would I begin to trust that as one life-crop (a job, relationship or stage of life) slows down, quits producing or dies off completely, the next is ready to bloom and bear fruit? Instead of worrying so much about where my bounty will come from and scurrying to store it away for the future just in case there won’t be enough later, perhaps I could simply surrender to the natural rhythm of just enough and the huge bounty of a small, daily harvest. Ahhh…the wonder and miracle of “Just Enough”…how lovely to find it sprouting in your garden as well. Thank you, Adayre! I really loved your post about the “just enough” concept of Oryoki as well (http://theviewfromhere-adayre.blogspot.com/2010/08/just-enough.html). May we all learn to trust that there will always be just enough.